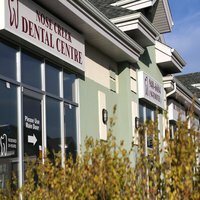 Nose Creek Dental Centre is a general dental office in Airdrie focusing on restoring and enhancing the functional and aesthetic needs of your smile. Dr. Monty Gaur and team strive to build personal trusting relationships with patients of all ages for a relaxed dental experience in a comfortable atmosphere with every visit. We hold ourselves accountable to provide quality, minimally invasive general dental services to rebuild healthy function to damaged and decayed teeth. We rely on conservative dentistry, using the least invasive procedures possible to restore health and beauty to patients’ smiles. Prevention is an important element to long-term oral health through conservative care, and we strive to minimalize disease and damage with every office visit. From fluoride treatments and sealants to professional cleanings and digital imagery, our Airdrie general dentists and hygienists educate patients about their oral health and means to better care for their teeth at home. We use routine exams to discuss medical and family histories to best understand and monitor potential health risks involved with systemic health conditions. We take infection control seriously and maintain a sterile environment to protect our patients from the risks of contamination. We follow the recommended standards of the Canadian Dental Association (CDA), the Occupational Safety and Health Administration (OSHA), and the Center for Disease Control (CDC). We understand that some patients are uneasy about visiting the dentist and may be apprehensive in receiving the proper oral health care they need. We welcome patients to our Airdrie general dental office to experience a warm and friendly atmosphere with a dedicated team of professionals who genuinely care about you, your family and your long term oral health. Contact our office to schedule an appointment. We’ll give you a reason to smile!